Another set of 153 Nigerian migrants were repatriated from Libya aboard a Libyan chartered flight at about 9:15pm on Thursday. Their return was facilitated by the Federal Government and the International Organization for Migration, IOM, and funded by the European Union project. 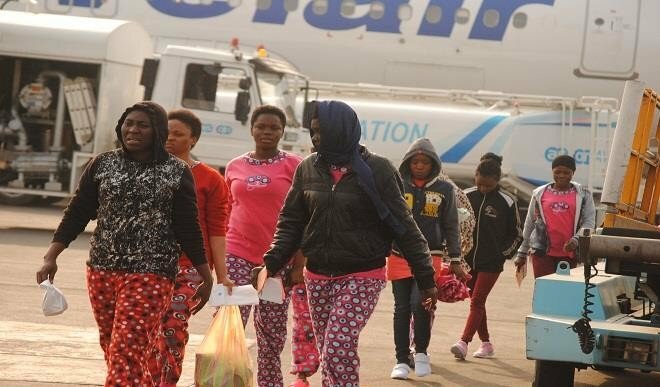 Nigerian Government on Wednesday repatriated 242 migrants from Libya. The National Commission for Refugees, Migrants and Internally Displaced Persons [NCFRMI] and other Government Agencies were on ground to receive them and ensure that they were profiled and registered. The migrants were given a stipend for transportation and taken to a hotel to spend the night before heading to their homes. Watch the video of their arrival below..